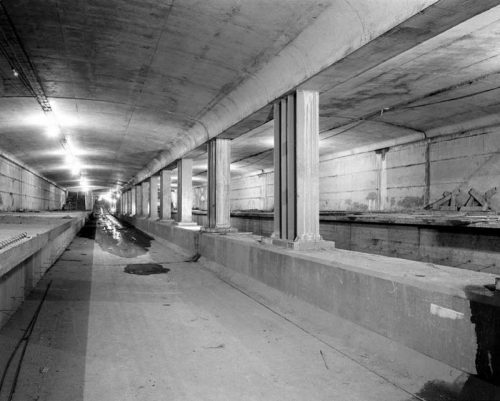 Much of the downtown section of the subway was built directly underneath Yonge Street. 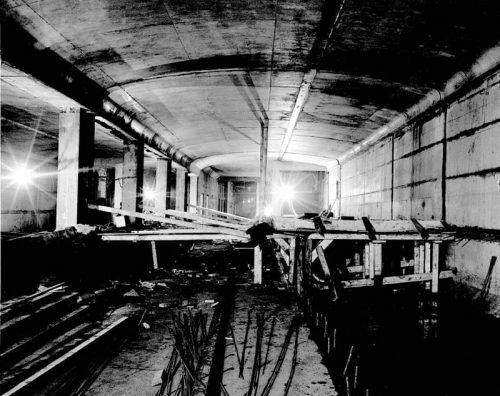 Since the street could not possibly be closed during years of construction, the subway was built using the “cut and cover” method. 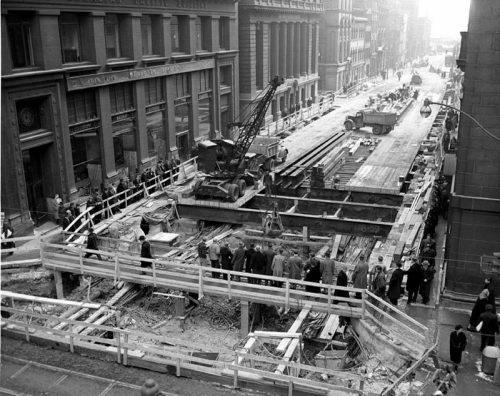 First, vertical steel piles were driven into the ground every six feet on each side of the street to provide support for the sides of the tunnel excavation. 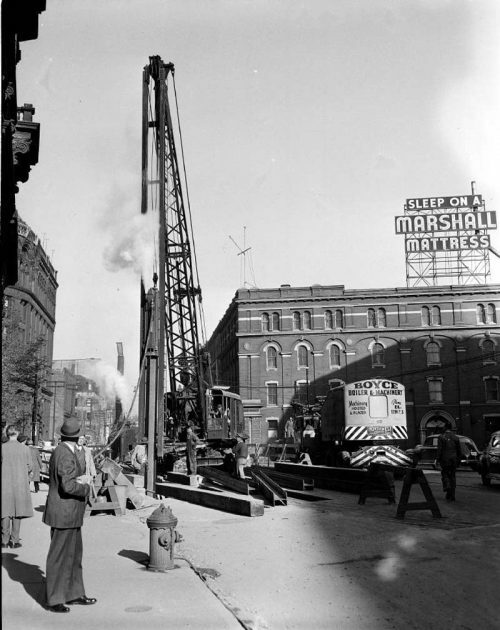 Then, workers and machines began to dig downward from the street, making the “cut.” When the excavation was deep enough, horizontal steel beams were rested on the steel piles. 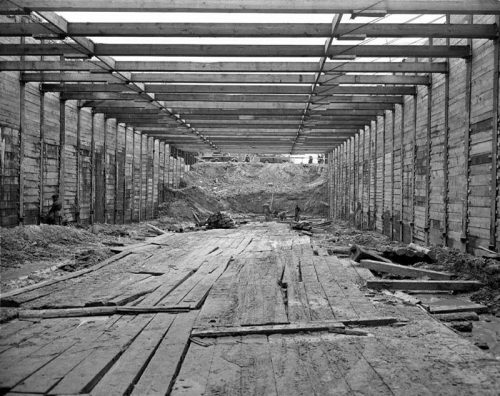 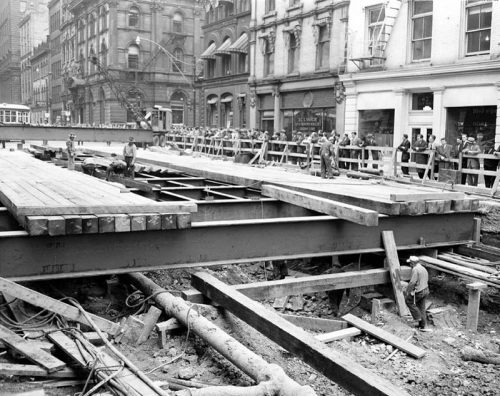 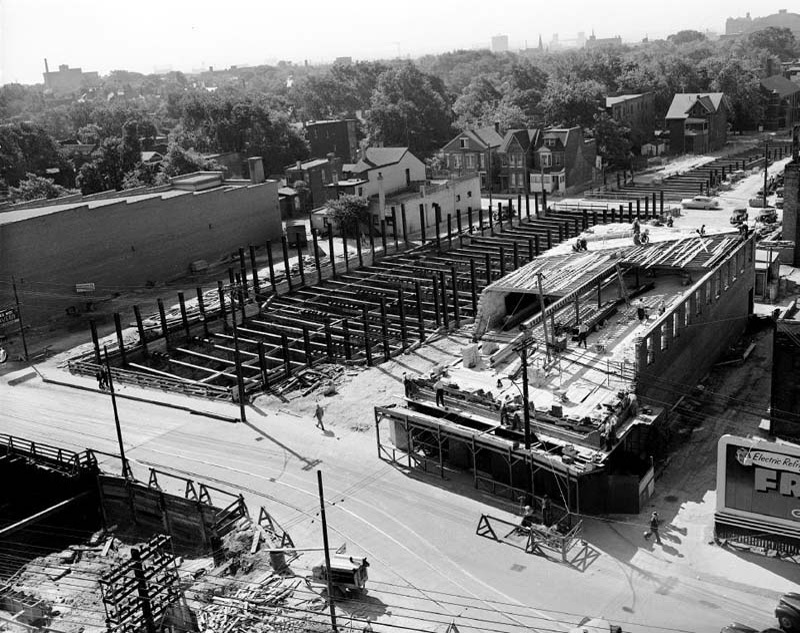 This image shows the one-foot-square timbers laid across steel horizontal support beams to provide a temporary surface for Yonge Street during construction. 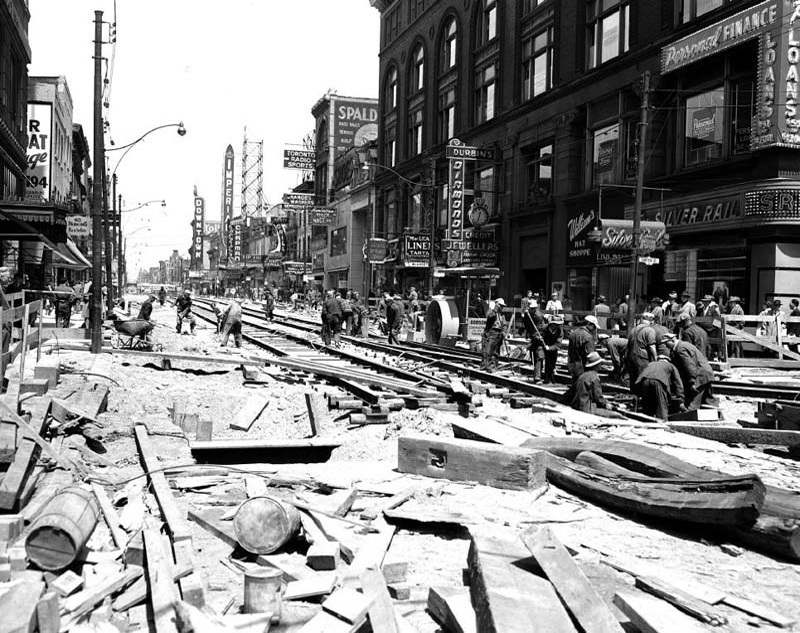 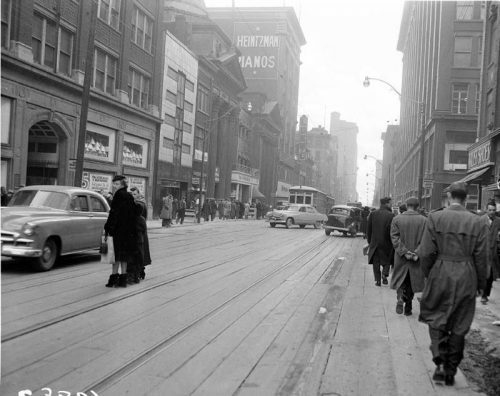 Once the planking was in place, traffic, including streetcars, could continue as usual on Yonge Street. 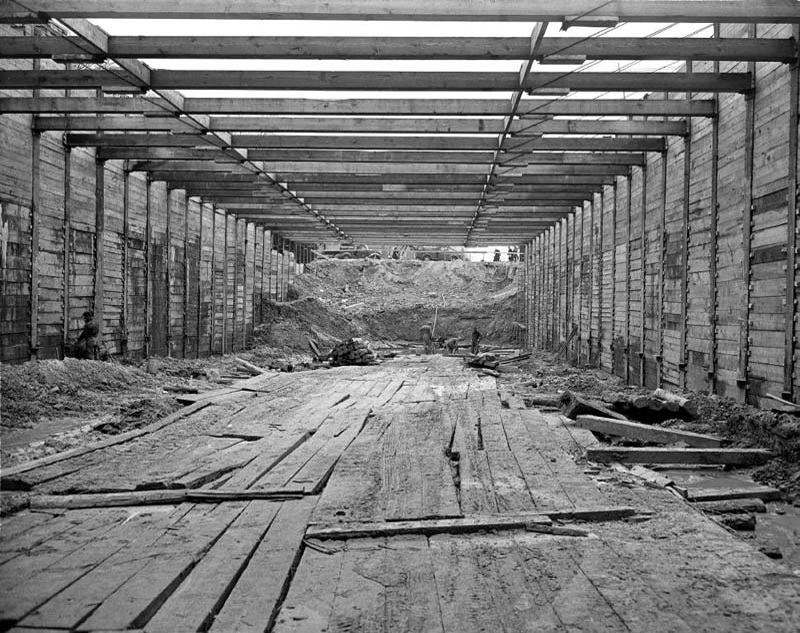 Huge timbers one foot square were then set across the beams, forming a temporary street-level surface, the “cover”. 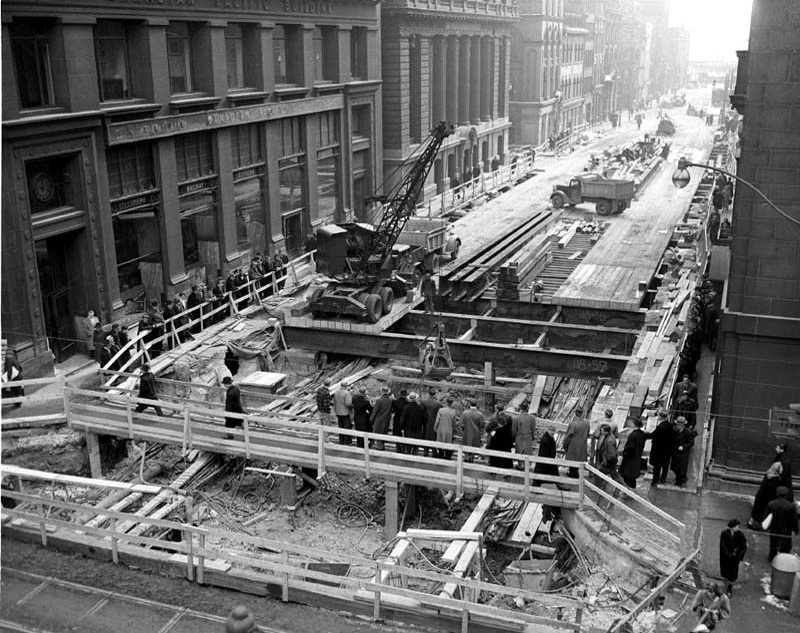 This was for traffic to use while work continued below. 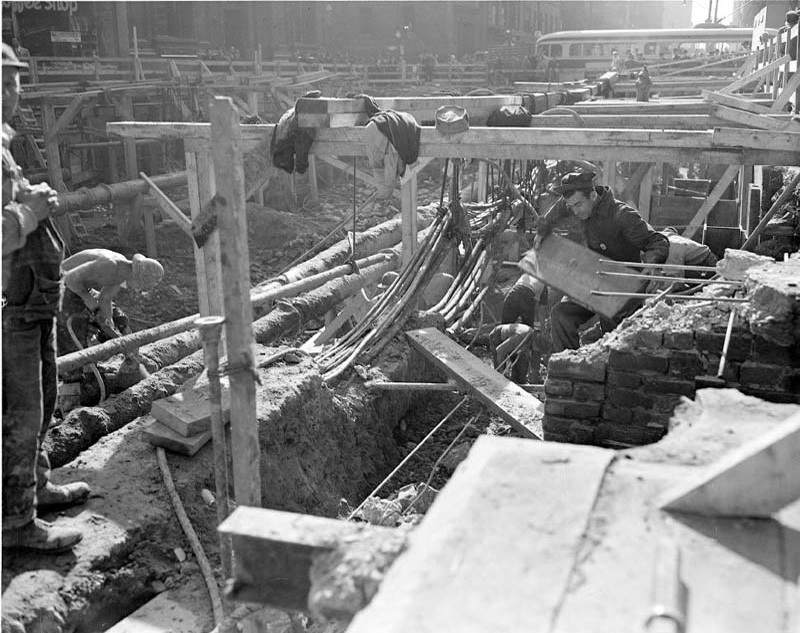 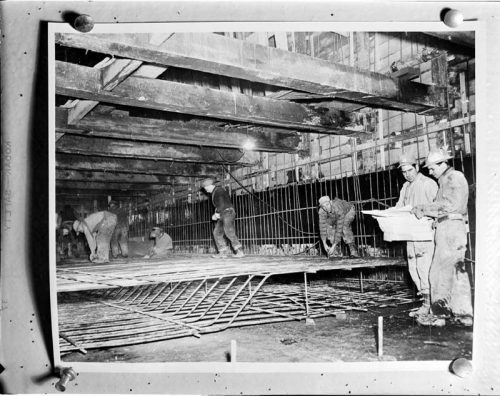 In places where the subway ran beneath buildings, the foundations of those buildings were deepened and reinforced while workers tunnelled from one cut to another. 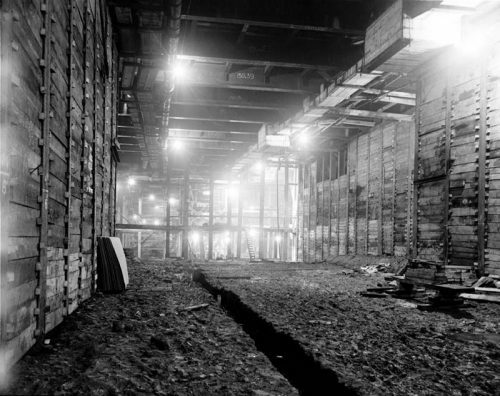 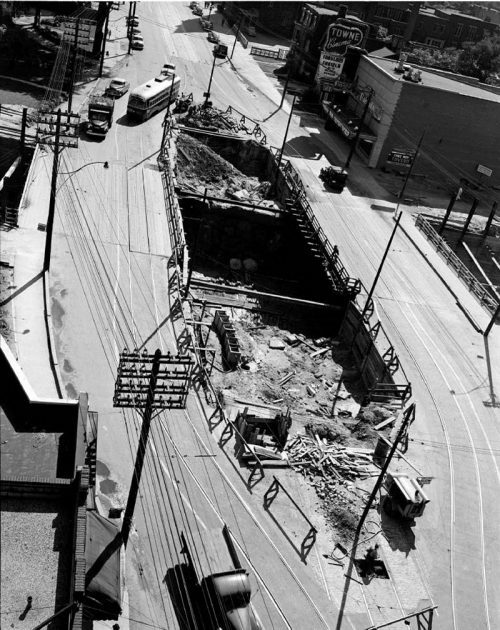 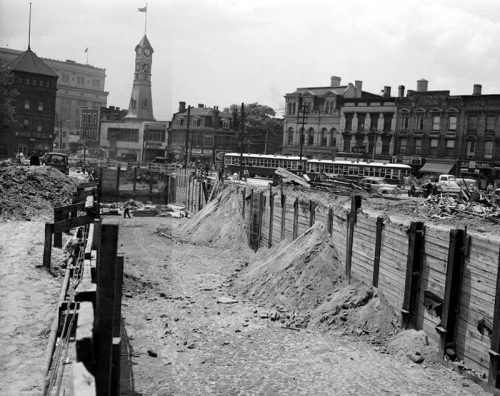 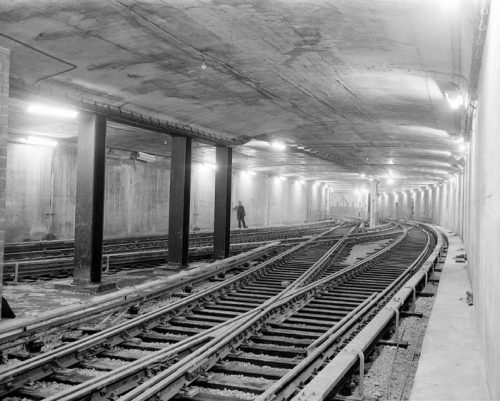 Once the concrete walls, floor, and roof of the subway had been poured, the piles were cut off, the remaining space was filled with earth, and Yonge Street was repaved. Excavation involved backhoes, dynamite charges to break up solid rock found south of Queen Street, and in some cases hand work with picks and shovels so that gas and electricity lines and water and sewage pipes were not damaged. 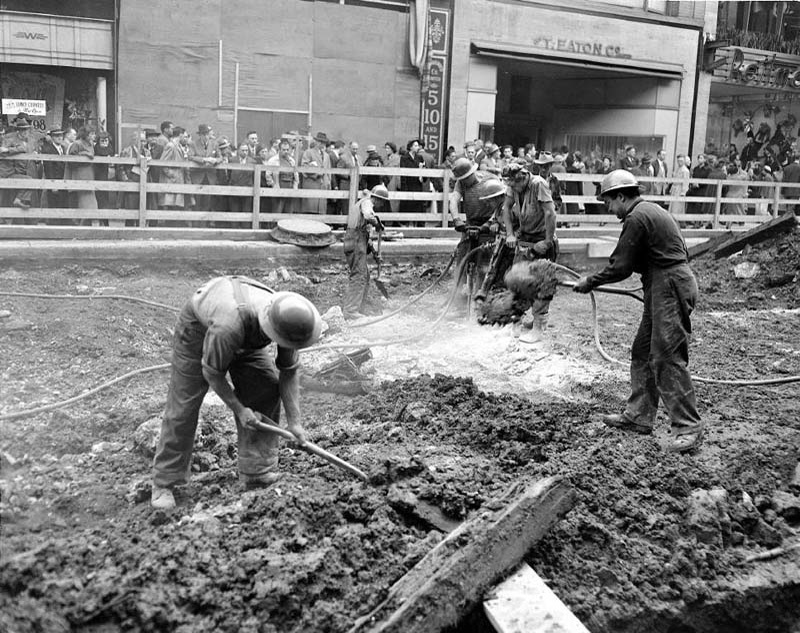 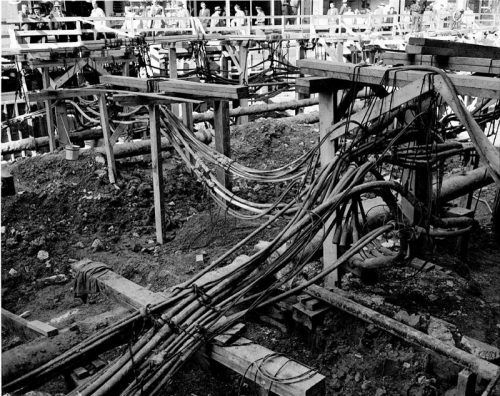 Public utility conduits and pipes had to be located and then supported and protected during construction. North of College Street, the subway veered so that it was no longer directly underneath Yonge Street, but rather east of and parallel to it. 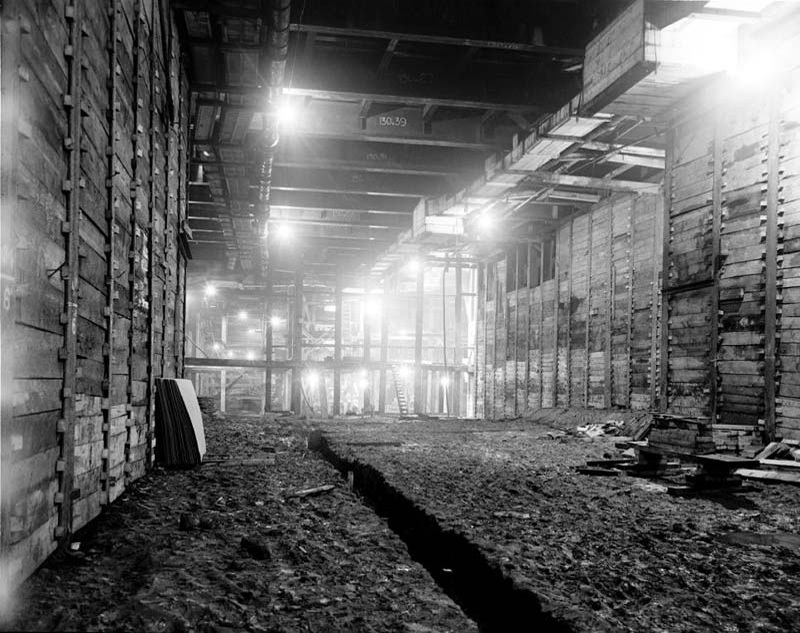 Existing buildings were demolished to allow for cut and cover construction, and were later replaced with more modern ones. The tower visible is a former fire hall, converted into St. Charles Restaurant, at 484-88 Yonge Street. 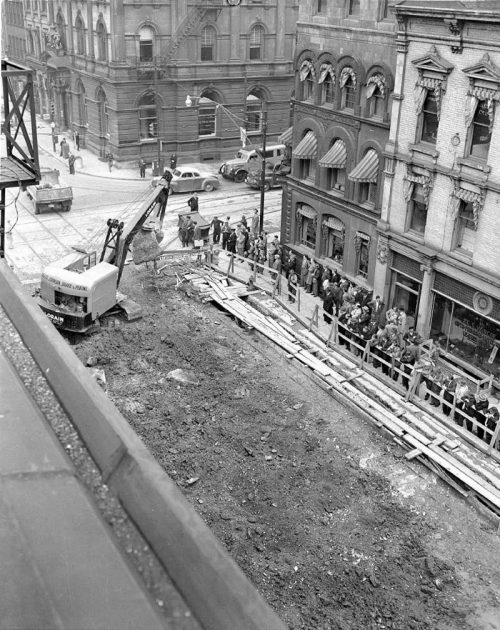 Two platforms, one for eastbound and one for westbound streetcars, were built in the centre of Bloor Street to allow passengers to walk from the streetcars directly down to the subway cars. 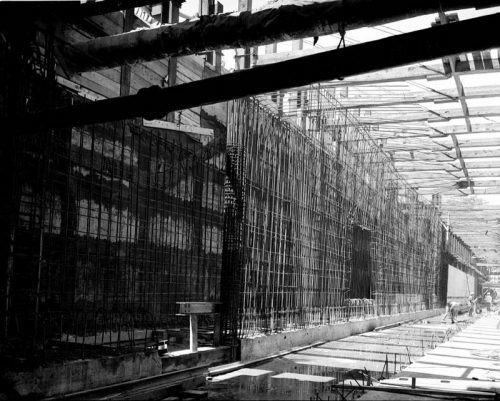 This image shows another example of the cut and cover method in progress. The previously existing small buildings were replaced with a highrise office building at 33 Bloor Street East. 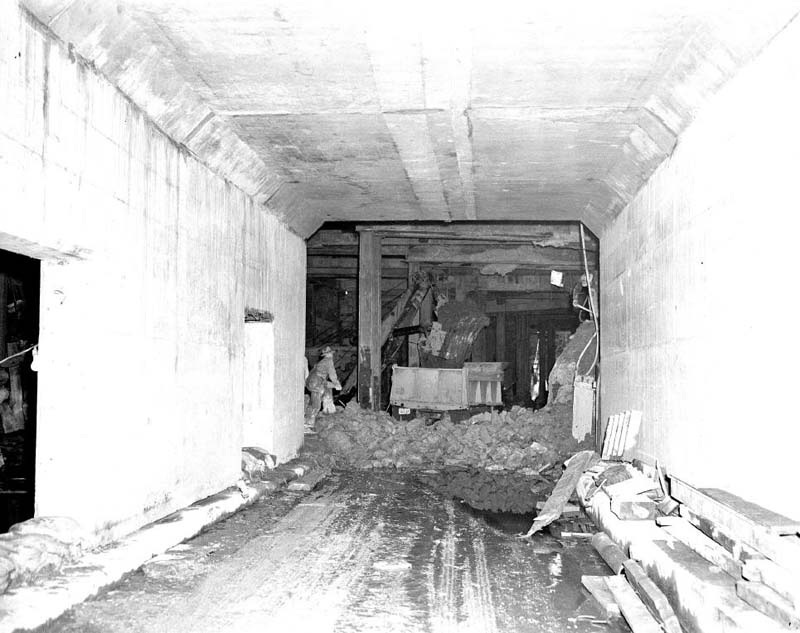 Backhoes used in the excavation were customized so they could be used in the restricted space. 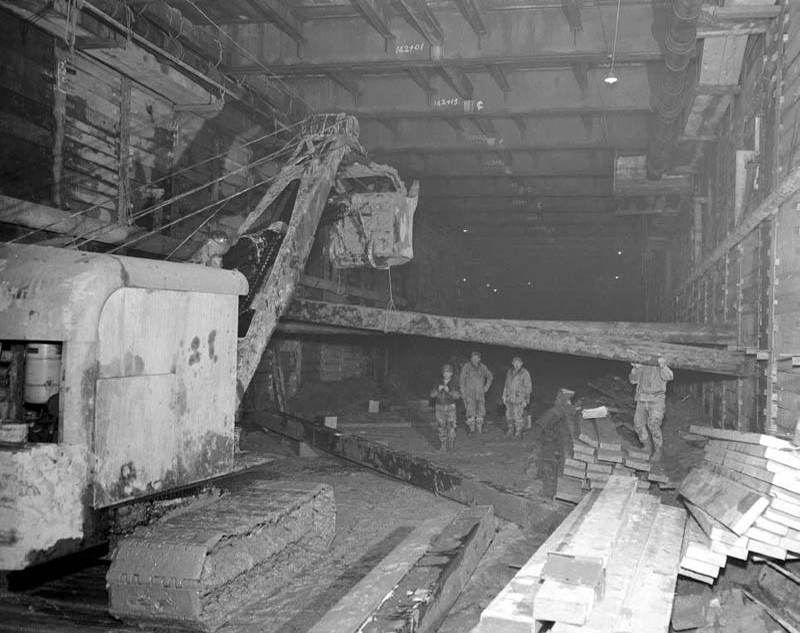 Dump trucks hauled out the soil and rock by way of several access ramps. 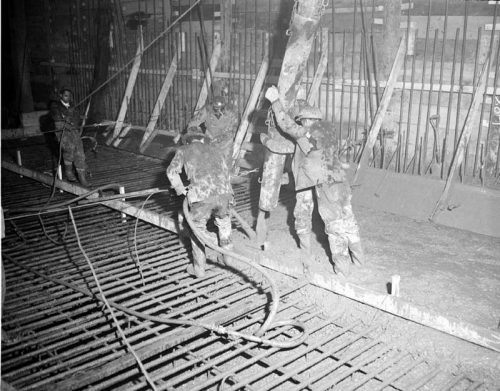 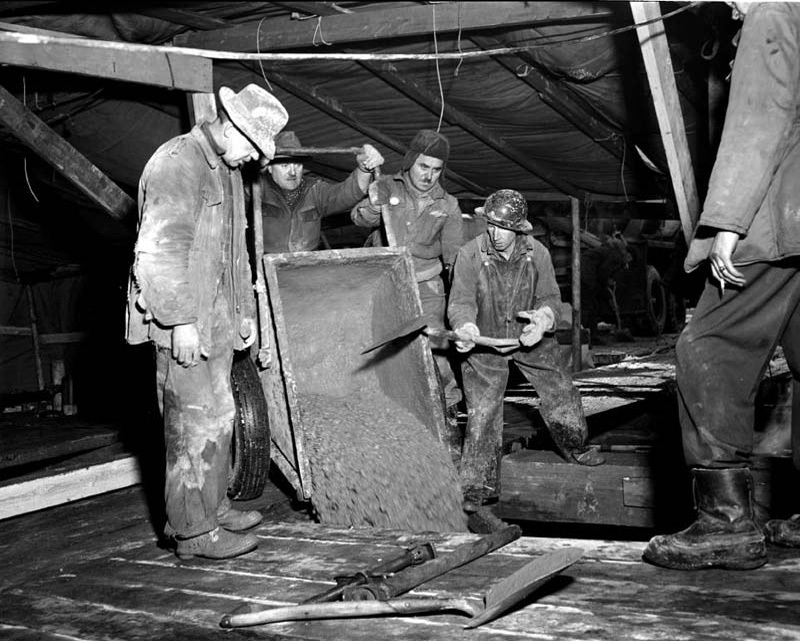 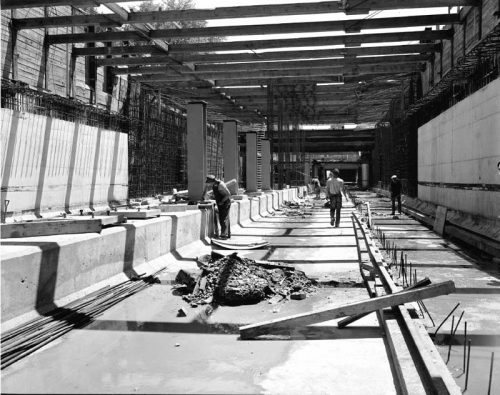 Steel forms (used as molds to contain the wet concrete in shape until it dried) were used in most areas, though plywood was used in control areas, passageways, and entrances. The steel forms were built in twenty-foot sections mounted on a frame that rested on rails on the floor. 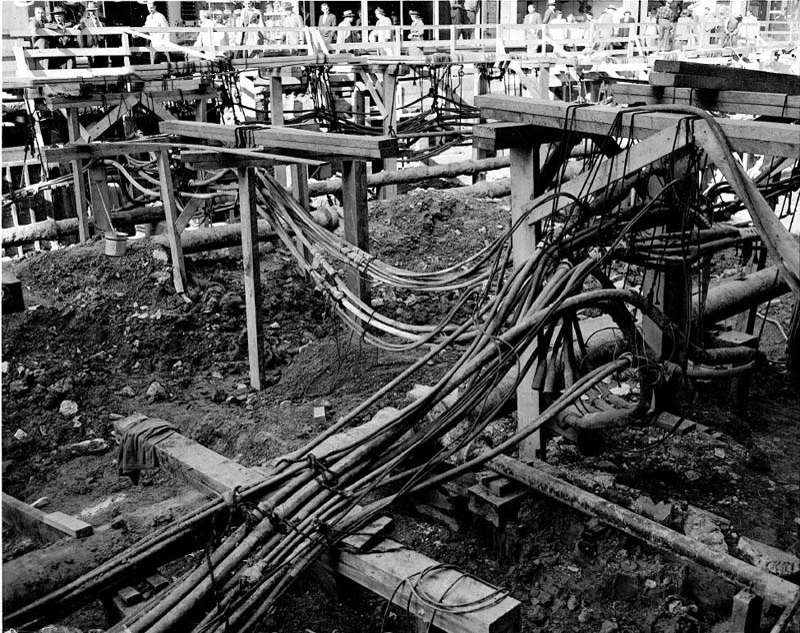 The forms could then be easily moved to the next area of the excavation. 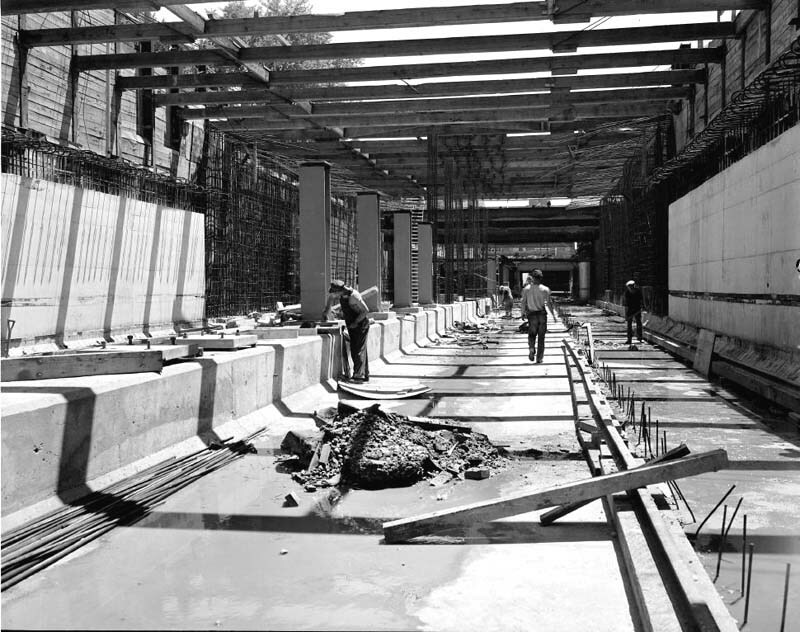 The arch of the roof in the stations conforms to structural design requirements, but was specially designed for visual effect as well. Original plans called for the centre supports (at the left of this image) to be concrete also, but they were instead made of steel columns to increase the feeling of spaciousness in the stations. 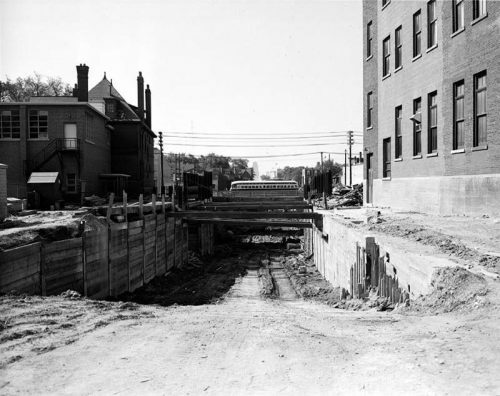 Canada’s First Subway: Why a Subway?